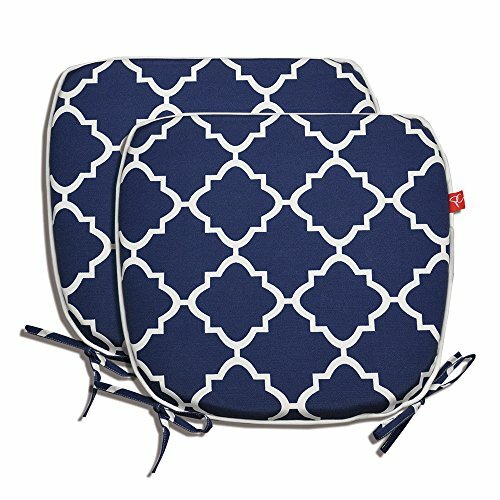 2 pcs 16x17x2 inch U-shaped seating cushions with two ties and invisible zipper, all weather resistant, UV fade resistant mildew resistant water repellent. 60-day no reason needed return and full refund, 100% satisfaction guaranteed. These seat cushions are not only suitable for indoor use, like home dining kitchen chairs, but also perfect for garden patio furniture, great decoration for your home, you will like it the second when you that you get it. Still bothering don't know how to choose gift for your friends and family? This would not be a problem anymore until you meet "PacifiCasual" , various home textile products for your choice. Water repellent, mildew resistant and feature UV protection to resist fading, resists weather and fading in sunlight more than 500 hours. Size is 17 inches in length, 16 inches in width, 2 inches in height. Material: 100% poly batting. Suitable for indoor and outdoor use. Package including 2 indoor/outdoor all weather seat cushions. Easy Care: Invisible zipper make the seat cushion cover easy to removal, spot clean or hand wash with cold water. Quality guaranteed, 60-day no reason needed return or full refund. If you have any questions about this product by PacifiCasual, contact us by completing and submitting the form below. If you are looking for a specif part number, please include it with your message.